2. Heat the oil in a large frying pan and fry the pepper for 3 minutes. 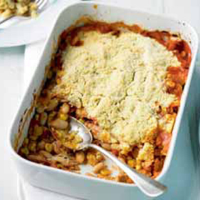 Add the sweetcorn, cannellini beans and chopped tomatoes, then cook for 2 minutes. Stir in the mackerel and transfer to an ovenproof serving dish. 3. Meanwhile, rub the butter and flour together to resemble breadcrumbs, stir in the cheese and season.Sprinkle over the mackerel and bake for 20 minutes.